It’s one of the most unique islands in New York City. It was renamed in anticipation of a memorial that was never completed. Residents, there have an unusual way of getting to work. It’s Roosevelt Island and it’s one of the more interesting sights you’ll see on an NYC Skyline Cruise. Roosevelt Island is part of Manhattan and residents there primarily live in apartment buildings. It is also the home to the newly constructed, cutting-edge Cornell Tech graduate engineering school, as well as Four Freedoms Park, named for a landmark speech by our 32nd president Franklin Delano Roosevelt. Roosevelt Island may be named for FDR, but it’s had several previous names in the past. The island was initially called Minnehanonck by native Americans, according to the New York Times. It was called Varken Eylandt or “Hogs Island” by the Dutch. In 1668, John Manning, a British sea captain who briefly surrendered the New York colony to the Dutch purchased the island. Manning’s stepdaughter Mary Manningham Blackwell inherited the island. It became known as Blackwell Island and it kept that name into the 20th century. New York City acquired the island in 1828 and it housed a prison, an asylum, and several hospitals. Famed journalist Nellie Bly launched her career by going undercover in the asylum in 1887 to expose conditions there, according to Mental Floss. The city renamed it Welfare Island in 1921 and after moving the prison to Rikers Island, the residential community began to develop. The island as we know it today started to take shape in the 1970s when it was renamed again for FDR and the famous Roosevelt Island tramway was constructed. While Four Freedoms Park does honor the former president, the island received the new name in anticipation of a bigger FDR memorial that was never completed. According to Cooper Union’s architectural school, the memorial was to be designed by famed architect Louis Kahn, but the project fell apart during New York City’s fiscal problems. What may be most associated with Roosevelt Island is their tramway which opened in 1976. It was the first tram in the country to be used for urban transportation according to the Roosevelt Island Operating Corporation. 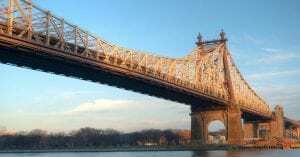 It carries nearly two million passengers a year from Roosevelt Island to Manhattan Island. You can see Roosevelt Island on Skyline’s public dinner cruises. It’s a sight not every area cruise line passes by. You can also celebrate anything aboard the Skyline Princess. We host corporate events, business meetings, Sweet Sixteens, anniversaries and of course weddings, many of which are presided over by our dear friend Captain Arnold. We can offer a full private ship charter or we can accommodate you by renting a private deck on one of our public cruises. For smaller groups, we’ll rent you a table or two and we even host wedding parties of just 2 or three people. We work with all types of budgets and it costs less than you think. Our public cruises leave from our home port located at the World’s Fair Marina in Queens. We also provide full ship private charters from many ports in NY, NJ, LI, Westchester and Connecticut. You’ll see it all aboard Skyline Cruises. Contact us today.